July 16, 2007, LG Crabo. Lasionycta sasquatch resembles a large and dusky form of Lasionycta poca which it replaces south of northern Washington. 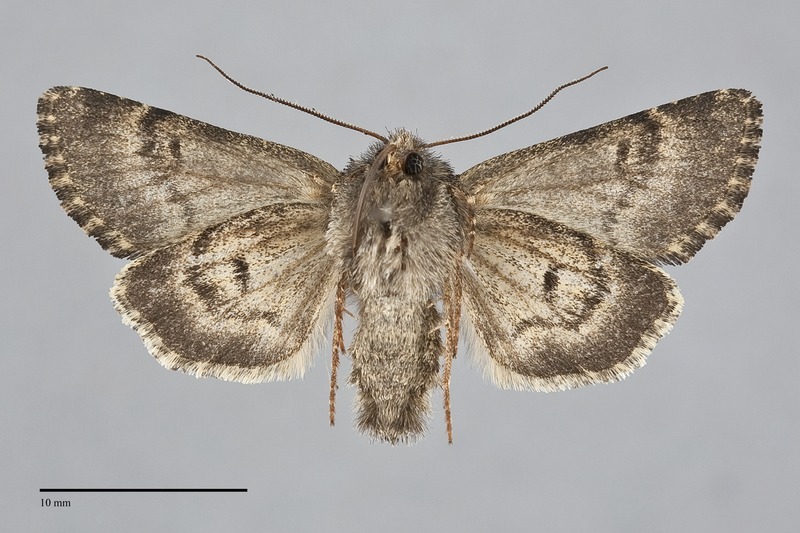 It is a medium-sized moth (FW length 14 - 16 mm) with dark smoky gray forewings and light tan hindwings with dark gray discal spot and marginal band that flies in mid-elevation forest and subalpine parkland in the Cascade Range and mountains of western Oregon. The forewing is dark gray to brown-gray with dark lines and spots and patches of yellow to slightly greenish scales. The dark gray lines are double and filled with slightly lighter gray than the ground color. The postmedial line is dentate, sometimes with pale gray tips on the dentations. A dark median line is faintly evident. The pale subterminal line is faint but its position is evident due to darker gray shading medial to it. The orbicular spot is round, filled with the ground color or slightly lighter gray and a dark central ocellus. The reniform spot is filled with the ground color and is relatively inconspicuous. The fringe is weakly checkered dark and light gray. The hindwing is light tan, suffused with gray scales. A large gray discal spot, thin sinuous to lightly scalloped postmedial line, and wide marginal band. The hindwing fringe is two toned, gray basally and white to light tan distally. The head and thorax are dark gray. The eyes are normal in size. The male antenna is weakly bipectinate. 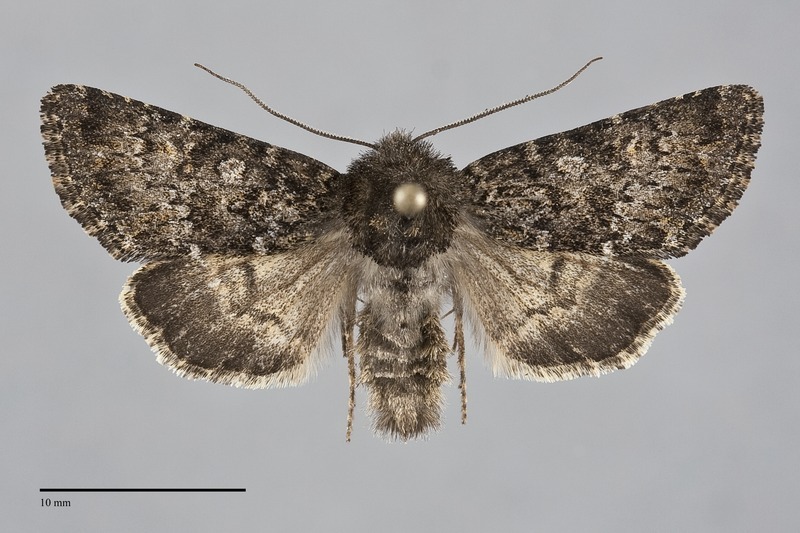 This species is most similar to L. poca, a smaller alpine species that occurs north the northern Cascade Mountains in Washington and British Columbia. These species are most readily distinguished by hindwing color. Those of L. sasquatch are dusky tan on both sides while those of L. poca are putty white. The forewings of L. sasquatch appear darker than those of L. poca and often have small patches of yellow or greenish-appearing scales. Those of L. poca are more crisply marked with gray and white and lack patches of other colors. These species prefer different habitats. Lasionycta sasquatch flies most commonly in high-elevation conifer forests, while L. poca is most often collected near rocky alpine tundra near timberline. Lasionycta sasquatch is similar in size to Lasionycta perplexella, an entirely gray to blue-gray species with similar shaped lines and spots that also flies in high elevation forests. The hindwing of this species is dark gray without a two-toned pattern like that of L. sasquatch. Its male antenna is biserrate with triangular individual segments unlike that of L. sasquatch which is bipectinate with longer extensions from each section. The type locality of Lasionycta sasquatch Crabo and Lafontaine is USA, Washington, Kittias Co, Quartz Mtn, 47.074° N 121.061° W, 1900 m.
This species is found in subalpine parkland and spruce-fir forests. It appears to be uncommon to rare wherever it occurs. Lasionycta sasquatch is a Pacific Northwest endemic species. It has been collected in the Cascade Range of Washington from the vicinity of Snoqualmie Pass south to Mt. Rainier and near Rimrock Reservoir, Yakima County. In Oregon it has been found on Saddle Mountain, Clatsop County in the Coast Range and in Josephine County in the Siskiyou Mountains. This species has not been collected outside of the Pacific Northwest. It likely occurs in the Klamath Mountains of northwestern California. This species is single-brooded. The adults fly during July. It is nocturnal and comes to lights.